› Consult annual reports of previous years: 2015 annual report, 2014 annual report, 2013 annual report, 2012 annual report, 2011 annual report, 2010 annual report, annual report 2009. 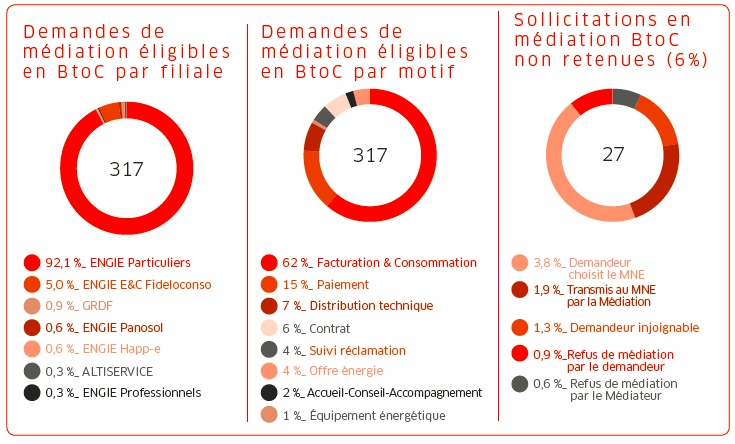 The number of mediation cases handled in the ENGIE Group has once again risen: 11% more than in 2015, up from 306 to 339, all markets and business units taken together. 93% of mediation cases concern B2C (private individuals) customers in the field of energy, making 317 of the 339 requests received. 85% of solutions proposed during mediation cases were accepted by the parties and implemented. Furthermore, mediation is a swift and effective process: the average resolution time for mediation cases was 64 days (the legal requirement – the order of 20 August 2015 in France – is to complete them in under 90 days), compared with much longer legal proceedings. 75% of complainants are satisfied with the Mediator’s intervention (against 70% in 2015). This improvement in claimant satisfaction is accounted for by the commitment of the Mediation team in unravelling the cases they handle, while claimants continue to have more exacting demands. Once again this year, most of the cases received and mediation processes carried out concern customers’ comprehension of energy bills, regularization amounts further to incorrect meter readings or adjustments to meter readings further to meter failures. ENERPRESSE – 15/06/17 >A 20% increase in requests referred to the Engie France mediator. A 20% increase in requests for the Engie France mediator..
On 13th June the Engie mediator Jean-Pierre Hervé submitted his 2016 annual report to Isabelle Kocher, the group’s Chief Executive Officer. The number of requests received by the mediator in 2016 was up 20% compared with the previous year (3,093 referrals). In parallel, the number of mediation cases rose by 11%. The average case handling time was 64 days (against 67 en in 2015), whereas the law fixes a maximum period of 90 days. “Once again this year, most of the requests received and mediation processes carried out concern customers’ comprehension of energy bills, regularization amounts further to incorrect meter readings or adjustments to meter readings further to meter failures”, states the press release. As far as outcomes are concerned, 85% of the solutions proposed by these mediation processes were accepted by the parties (92% in 2015) and implemented, while 75% of the complainants said they were satisfied with the mediator’s intervention (against 70% in 2015). In 2016, based on the special case he dealt with in the year, the Mediator made 11 recommendations (against 19 in 2015). They were discussed with the ENGIE Group business units concerned to ensure their implementation, as well as with consumer organizations. The details of the recommendations are set out in the 2016 annual report. Recommendation 11: “ENGIE Home Services, improving customer satisfaction ”.